Johnnie Walker, the character from the Scottish whisky, keeps walking through history in “Striding”, a television commercial released in 2007. 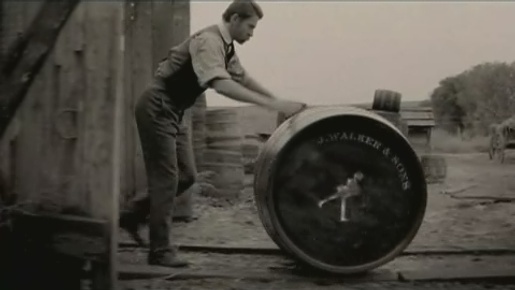 The commercial marked 100 years since the rebranding of the whisky from Walker’s Kilmarnock Whiskies to Johnnie Walker Whisky, the creation of the slogan, “Born 1820 – Still going Strong!”, and the design of the Striding Man by cartoonist Tom Browne. 100 years covers the first flight by the Wright Brothers, construction of the Empire State Building, the first ascent of Mt Everest, civil rights protests in the USA, walking in space, the fall of the Berlin Wall… Here’s to the next 100 years of progress. The first version, 45 seconds, features “Miserere” by Ennio Morricone. Striding Man was developed at Bartle Bogle Hegarty, London and New York by executive creative director John Hegarty, creative director John Foster, art director Nick Klinkert, copywriter Kevin Doyle, account director Erin Riley, agency produce Katherine Cheng. Filming was shot by director Rob Sanders via Backyard, with director of photography Eric Treml, executive producer Kris Mathur, producer Anton Maillie, production designer Marco Puig, producer (Budapest) Eszter Répássy, and SFX manager Péter Szilágyi.